TODAY’S GAME: Today the Generals continue their 9-game homestand (1-5), with game 3 of the 5-game set with the Montgomery Biscuits (TB). The Generals look to snap a 4-game losing skid, which ties for a season-long. The Generals are 6-7 against Montgomery this season, 2-3 at Pringles Park. Jackson leads the overall series with Montgomery, 68-66. The two teams meet 11 times during the month of July. GENERALS RECAP: On a sweltering Wednesday afternoon at Pringles Park, the Generals dropped their 4th straight, losing to Montgomery 4-3. 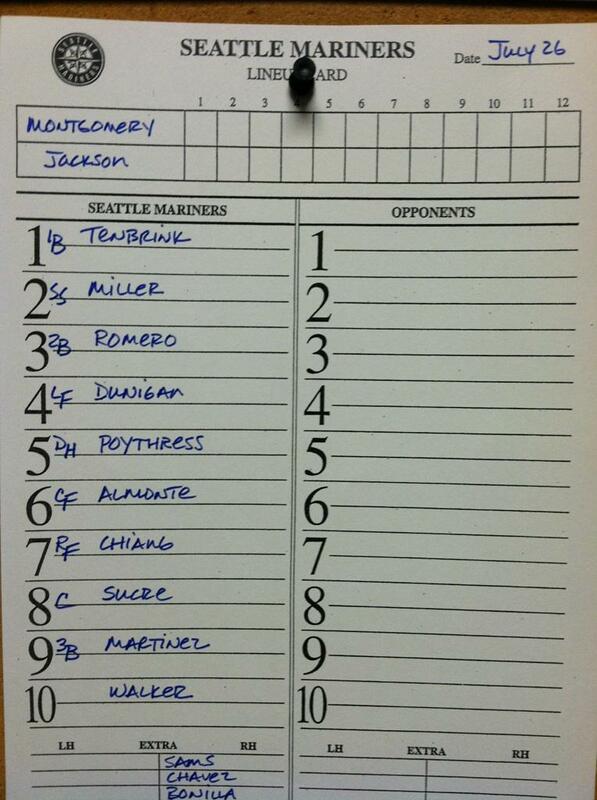 The loss places Jackson in a 0-2 hole in the 5-game series. The loss dropped the Generals to 17-14 in the second half, 2 ½ games behind the league leader Chattanooga, in the second half standings. Montgomery jumped out to a quick 4-0 lead Wednesday by scoring two runs in the 3rd and two runs in the 5th. Jackson broke a streak of 13 straight scoreless innings in the series after a solo homer from Kalian Sams leading off the bottom of the 5th inning. Jackson made it 4-2 in the seventh on a Ralph Henriquez RBI groundout. 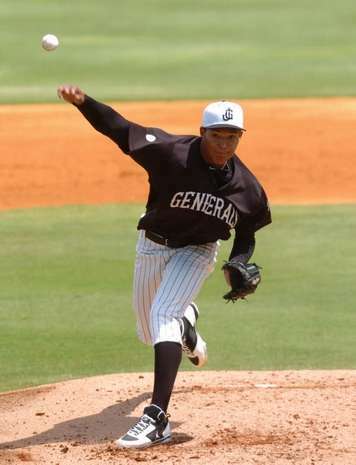 Stefen Romero pulled the Generals within a run at 4-3 in the 8th inning with a sacrifice fly to center. Jackson went in order in the ninth against Montgomery closer Kirby Yates, who earned his 12th save of the season. Jackson starter Forrest Snow (1-5) took the loss, allowing 4 runs on 7 hits over 5.0 innings pitched. Snow walked 3 and struck out 4. Leury Bonilla led the way offensively for Jackson with a 2-for-3 afternoon at the plate. MARINERS FUTURE IN JACKSON: With the addition of Brad Miller, the Generals roster currently contains 11 of the top 30 prospects in the Seattle Mariners organization, including three of the top six. P Taijuan Walker (pictured right, Michelle Gachett) (1), P James Paxton (3), INF Francisco Martinez (6), INF Brad Miller (11), P Carter Capps (16), P Forrest Snow (19), P Brandon Maurer (21), OF Chih-Hsien Chiang (24), P Mauricio Robles (26), OF Johermyn Chavez (28), INF Rich Poythress (29). “KISS IT GOODBYE”: Over the course of the last 10 games, the Generals have hit 10 home runs, including 3 multi-homer games. The Generals lead the league with 78 homers this season..
WHO’S HOT? : INF Rich Poythress had an 18-game on-base streak snapped yesterday finishing 0x3. During the streak, which was the 2nd-longest by a Jackson player this season, Poythress batted .419, with 6 doubles 7 runs and 7 RBI. VIVA LA ROMERO: INF Stefen Romero has hit safely 22 of 27 games with 13 multi-hit games with Jackson since his promotion, batting .346 (36×104) with 18 runs scored, 10 doubles, 2 triple, 4 home runs and 28 RBI. CAPPING OFF GAMES: RH Carter Capps has allowed only 2 earned runs (3 R) over his last 36.1 (0.51 ERA). This season he is 2-3 with 18 saves and a 1.29 ERA (7 ER, 49.0 IP). He has limited opponents to a .214 (39×185) average, while walking 12 and striking out 70. Capps has held opponents scoreless in 33 of 37 relief appearances this season.